Coinciding with the strategic repositioning of Le Meridien, the hotel chain gave a carte blanche to Thierry Dreyfus to light up its newest address in the heart of Shanghai. Identifiable from far away, the 66 storey high building is crowned at the top by two huge antennas that look like two little devil’s horn. “In this city that is hungry with power, that needs to build high in the sky, that is all glitter, I wanted to create a kind of breath, bring a human rhythm”. Resembling a heart that beats, the building lights up following a slow paced, steady breath every 12 minutes. 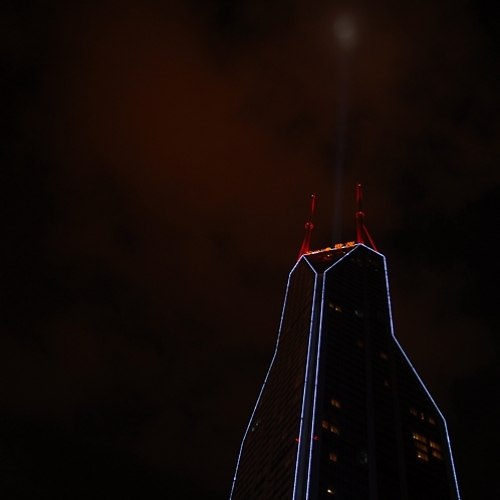 Then it directs five red beams of light towards the sky (5 symbolizes power but also recalls the five pillars of Feng Shui) before it bows in direction of the old city, then hits the new city. Five times twelve equals sixty : as a result, the building seems to live on a biological rhythm and breathe in rhythm.